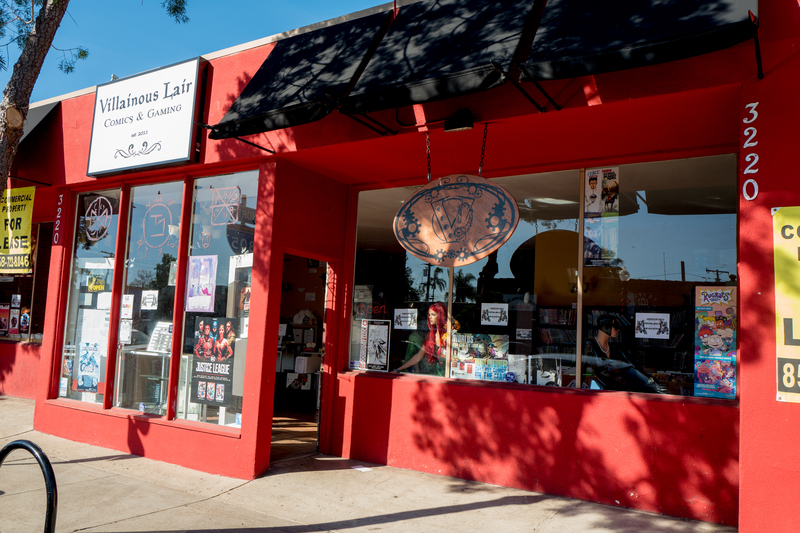 Part of the reason, yesterday, I walked down Adams Ave. to Pet Me Please (for cat food) was to swing by Villainous Lair, which is a cool comics shop that also hosts gamers. Last week, I read a San Diego Reader news story by Mike Madriaga about the store closing on January 31. Employees confirmed closure and the date, although much stock remained to be sold—50-percent-off list price this week. Role-playing game activities, along rows of tables and chairs in the back room, will continue as usual until the last day. Tonight, as part of a kind of send-off party, there also will be live Rocky Horror Picture Show in the store. I shot the Featured Image, of the shop, when leaving, using Leica Q. Vitals, aperture manually set for street shooting: f/8, ISO 100, 1/125 sec; 28mm; 1:59 p.m. PST. At a time when smartphones rivet attention to the inanimate, role-playing gaming is a vital point of human interaction—and one I relate to. During high school, best buddies the Chung brothers turned me on to the original Dungeons and Dragons and my favorite board game (of the time), Empire of the Petal Throne. Forty years ago, I nearly flunked out of school a tight-knit group of college friends, with whom the game displaced too many hours of sleep (and studying). But this post is about a different type of role-playing: People who pretend to be journalists and the unsung heroes who really are. Let’s begin with Mike Madriaga, who belongs in the latter category. I started reading Mike’s San Diego Reader reports after my wife asked me to look at his piece “Cat on a wet tile roof rescued 10 days later“, with fantastic dek: “Rotisserie chicken bait on edge, tuna water on ramp, fish feast in trap”. While a seemingly simple and inconsequential event, Mike makes it larger, by crafting compelling narrative based on first-hand reporting. This is journalism at its purest. Local. Sourced. Original. There’s something of a metaphor here, circling back to the game shop: The current state of journalism is a villainous liar of subjective, poorly-sourced, agenda-driven writing that as an editor I would never call reporting. To be absolutely, unequivocally clear, I do not refer to so-called fake news but to the voluminous, regurgitated bias that comes from mainstream media. Into their stories, too many reporters interject too much opinion—often presented as values everyone should share, lest they be labeled into one of many despicable categories: alt-right, alt-left, homophobe, misogynist, racist, or sexual predator, to name a pittance. I have long argued that small, local newspapers, with audience they can interact with and from which there is swift accountability, are among the best standard-bearers for responsible reporting—starting with first-hand sourcing. As I often counsel other journalists: Write what you know to be true—in the moment, based on your own reporting. If you didn’t interact with the source directly—whether human being or raw data—you don’t know what’s true. Good journalism is all about interesting storytelling (to the targeted audience) based on first-hand news gathering. Stories should follow the reporting, wherever it leads. They should not start with the reporter’s preconceived notion that he or she seeks to validate (and in process dismiss disproving sources). Nor should they be interjected with the writer’s opinion passionately presented as fact, but with the authority of what was once called the (impartial) God Voice. Narrative can be interesting, original, and passionate when the reporting—particularly about the kind of sources who are mainly Mike’s topics—drives the story. His style, which arguably is more traditional print journalism, gives voice to the sources rather than his own opinion being interjected. In Columbia Journalism Review essay “Rewriting the rules: The new voice of journalism“, Joyce Barnathan, who is president of the International Center for Journalists, explains how Millennials in particular are put off by traditional news reporting style and want more passion. “Does this mean that tomorrow’s journalists should be more partisan, voicing a strong point of view rather than a balanced perspective?” she asks. “I don’t think that’s it. I do think what’s called for is a new form of storytelling”. Passion isn’t the same thing as opinion. I write passionately, so much that as a tech journalist I was long ago labeled by the Mac community as being anti-Apple. I chuckle, because I am a long-time user of the fruit-logo company’s products, currently and starting in December 1998. My passion, as expressed in sourced storytelling, isn’t necessarily my belief, thinking, or values. As a journalist, very little of my news writing reflects my own opinion. You can be a passionate and interesting storyteller without being opinionated. That said, bias is inevitable. No news gatherer is impartial. From that perspective, I am relieved at the seemingly impartial God’s Voice retreat. It’s a fictional authority. But a reporter’s overt opinion shouldn’t become the replacement authority. What’s needed now is the application of the Fourth Estate’s ethical practices to the Fifth Estate’s demands for passion and immediacy. The “new form of storytelling” isn’t that different from the old—at least from local newspapers. Where they can come up short as a model, particularly for the online era: Treating stories as contained entities, which is something the confines of print made mandatory. There was only so much room on the page, and the story had to be a complete narrative before being committed to print. In compelling July 2009 essay “Product v. process journalism: The myth of perfection v. beta culture“, CUNY J-School professor Jeff Jarvis explains why “online, the story, the reporting, the knowledge are never done and never perfect”—in contrast to the traditional print medium. Process journalism is a trendsetting, news gathering concept that really isn’t so original when thinking about television news, where breaking stories change as more information is gathered. Journalism is a process. Readers are part of the process, and they may know something that the reporter doesn’t. A seemingly incomplete story advances when reliable sources step forward after reading it. That said, local newspapers are often closer to sources and the audience because they are, well, local. That presents huge tactical, authoritative and accurate news reporting advantage over far-flung, online-only news organizations. Let the reporting drive the story to wherever it leads. Only-second source when you can’t first-source directly. Don’t use social media, like Facebook or Twitter posts, as first-hand sourcing. Write what you know to be true in the moment based on your own original reporting. Construct your narrative framework around the sources you have gathered, favoring direct quotes. Treat your stories as ongoing processes that will continue based on first-hand interaction with (identity-verifiable) readers and others. Journalism is a responsibility that serves the public trust—and trust is the journalist’s only redeemable commodity. Once lost, it can never be regained. If you are a news gatherer, be smart. Don’t get caught in the villainous liar.